This is another recipe that started with the N&O. It’s another special breakfast at my house, and great for holidays. It’s both sweet and savory, and inspired by an upside-down cake. You start by frying bacon in a skillet. Once the bacon is crisp, you top it with a layer of thinly sliced apples. Give those a couple minutes to soften, then add a hefty sprinkle of brown sugar and cinnamon. Finally, pour on the batter and pop the whole thing in the oven to finish. When it’s done, overturn the pancake onto a serving platter and cut it into wedges. You may not need to, but there’s no harm in dousing the whole thing with maple syrup. In a blender, combine the milk, egg, oil and vanilla; blend until smooth. With the blender running on low, sprinkle in the flour, sugar, baking powder and 1/2 teaspoon salt. Stop blending as soon as the mixture is smooth. Set aside. Use an apple corer or melon baller to core the apple, but leave the fruit intact. Set the apple on its side, then cut it into thin round slices. Set aside. Heat a large oven-safe skillet over medium. Add the bacon and cook for six to seven minutes on one side. Spoon out and discard about half of the fat in the pan, then turn the bacon strips to cook on the other side, laying them flat and evenly over the bottom of the pan. Top the bacon with the apple slices, arranging them evenly. Cover the pan and cook for two minutes. Mix together the brown sugar, cinnamon and a pinch of salt, then sprinkle the mixture over the apples. 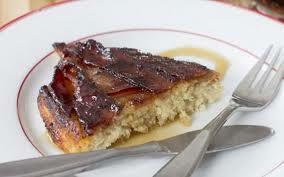 Carefully and evenly pour the pancake batter over the apples and bacon. Place the skillet in the oven and bake until lightly browned and cooked through, about 20 minutes. Let the pancake cool for 5 minutes. Use a paring knife to loosen the edges of the pancake, then overturn a large serving plate over the skillet. Invert the skillet to release the pancake onto the plate. Cut into wedges. I use a cast-iron pan to make this, but any oven-safe skillet will do.